Utilizing VTP Transformer Oil Filtration Systems, the quality of insulation oil can be upgraded and the deteriorated oil can be reclaimed that could extent the life of insulating oil and ensure safety operation of oil-filled electrical equipment treatment. VTP Transformer Oil Filtration Systems can efficiently removes water, gas and solid contaminants. It removes free water by demulsification, coalescence and separation, after purification, the free water content is less than 5 PPM. VTP Transformer Oil Filtration Systems separates solid contaminants by different precision filters elements, and recover cleanliness, the cleanliness can reach NAS 6 grade. Through the dehydrator, degasification, filtration processes, the dissolved gases and moisture, solid particulate, contamination can be completely removed. VTP Transformer Oil Filtration Systems is widely used in factory workshops, power transmission, generation station etc. 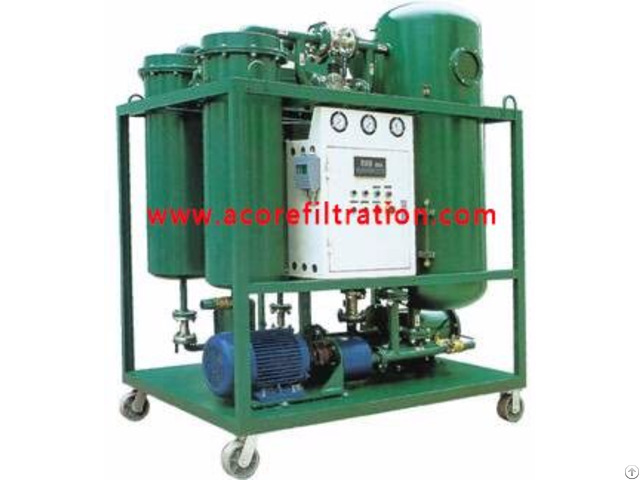 Business Description: Acore Filtration Co.,Ltd is one of leading manufacturer of oil filtration systems in Chongqing, China. We provide high quality used oil purification, solutions, and efficient after-sale services to every customers. Since foundation, Acore had been in the research and development of oil filtration systems, so we have very rich experiences in custom engineering and producing. In order to ensure the oil purifier achieve better filtration efficiency and work well under any conditions, we pay more attention to the rigorous management during the course of the producing and inspection the quality. we have a clients base of more than 200 countries worldwide.